Photo courtesy of Bruce Thomson. Some Rights Reserved. To be the most relevant, we’ll start with the festivities in mid-August, as this is the start of what is known as Green Season II — August 15 to November 14 — where the rain continues to provide a very lush, green setting. Mother’s Day is taken very seriously. Mothers are given a well-deserved day of recognition in a culture where many children stay at home until they marry. The 15th is an official holiday and banks, businesses, etc. all close for the day. San Ramon Day is a religious day to commemorate the patron saint of San Ramon town. Local churches parade their saints to the main town church on the 30th and then the celebrations begin. Lantern Night begins at dusk on the 14th as school children parade through their town singing national hymns and carrying homemade lanterns. The tradition dates back to the actual declaration of independence from Spain in 1821, when legend has it that the news arrived with a rider on horseback from Guatemala, and the citizens of Costa Rica lit their lanterns to welcome him. Children make their lanterns with red, white and blue paper and incorporate national symbols in their designs. 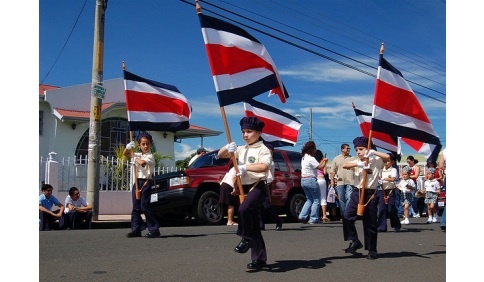 Independence Day is celebrated through Central America on the 15th of the month. Costa Ricans are fiercely patriotic and the flag flies from every home, store and even taxi. School children parade down the streets on their local towns in marching bands or in national dress, and the whole community comes out to enjoy the celebrations. Limon Carnival is celebrated over ten days of parades, bands and activities to pay tribute to the region’s Afro-Caribbean community. Beginning in the second week of the month, the festivities are loud and marked by colorful costumes and performances. Limon’s other inhabitants also take this opportunity to explore and honor their roots with Chinese dragons and ornately dressed indigenous Panamanians adding to the Caribbean flavor. Brass bands and drums from local schools contrast to the reggae tunes and Salsa as live music fills the air. Food is a huge part of the celebrations with street vendors hawking spicy meat patties and coconut tarts, and families sitting at roadside restaurants for Jerk chicken and Rondon washed down with flavorsome Ginger Ale. The festival was apparently dreamed up by Alfred Smith in his barber shop in 1949 as they chewed the fat while shaving. The celebrations have grown over the years, but the purpose of easing tensions between the black and Spanish-descended inhabitants remains the core of the festivities. Stay in the city itself or as most visitors do, travel up for the fun from Cahuita or Puerto Viejo further down the coast. Race or Roots Day or Culture Day (once known as Columbus Day) is celebrated on October 12 across the Americas. Columbus is remembered as ‘discovering’ the country in 1502, when the island of Uvita was spied off the shores of Limon, but his legacy is no longer the focus of these annual fiestas. Instead, Costa Ricans rejoice in the many different races and religions that have contributed to the country’s rich culture today. Corn Festival is celebrated mid-October to honor the food that was the dominant staple of the region in Pre-Columbian times and is still central to many menus today. The festival is held in Upala, near the border with Nicaragua, with the unusual challenge that the competitors for the beauty queen competition have to wear costumes made from corn products. The big event is the race of traditionally-crafted boats. Stay tuned to read more upcoming celebrations in the days ahead!